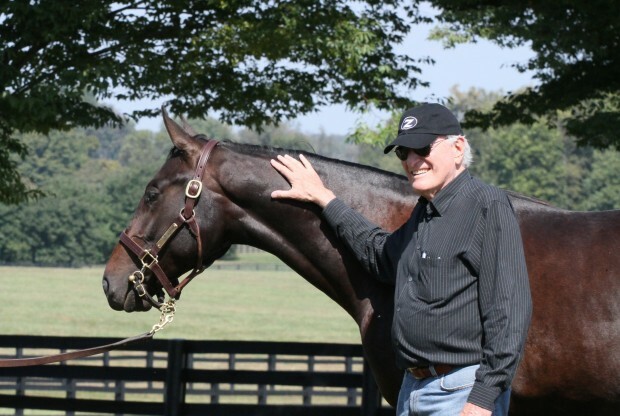 Zenyatta, 13Z and Cozmic One were visited by Jerry and Dottie this weekend. It was a particularly special visit because they were there to see Coz off as he departed Lane’s End for Mayberry Farm in Florida. At Mayberry he’ll follow in his mom’s footsteps and focus on his new routine—learning to be a racehorse. Alys captured video of his departure for the fans. The team spent time with Zenyatta, who is looking great and in foal to War Front. They also said hi to 13Z, who’s having a blast this fall with his buddies. We’d like to thank Lane’s End for all of the time, enery, and love that they have put into Coz. For that, we are very grateful. Hoofit lost his life today due to a leg infection. He survived an earthquake, hurricane & shipping across the world but this was too much. Very upset about this. He was a wonderful horse, and his name was perfect for a racer. RIP Hoofit. Oh how terrible, to have survived so much and lose your life to something seemingly so minor. RIP Hoofit. This is so sad. RIP dear Hoofit — you are much too young to leave us. Condolences to all connections. This is a huge loss. So sad to see this news. He was one that I enjoyed following. May he rest in peace. @Vicki B. and TC, GP–I had to print out that Alydar article so I could read it at leisure. He is so closely related to our Money. That is something else. We do have a Kindle, and I will be ordering. We have been cheated out of lots of money by a crook, so I can only imagine the depth of depravity. These guys need their own special punishment. @Sandy–say it isn’t so about our boy Dullahan! Are the BC winners going to be the “last horses standing”? Something is clearly wrong, and I think a lot of us suspect what it is. Barabra–The combination of A Wild Ride and the article will tell you all you need to know. After you finish reading them both, I would appreciate your opinion. By the way, congratulations to Baylor on another win . @TC, GP–thanks! It wasn’t a pretty win, but it counts as a “w”. Pretty scary. Kindle is actually hubby’s, but I ordered the book and will commandeer it to read myself after I let him see it first. Will be glad to let you know. The book actually starts out with the death of Alydar but very little is said about him after that. And, since you also have the article, you know that Alton Stone is actually a part of the plot. I will continue to vent about this as long as there are people out there who don’t know this story. Barbara, they do indeed deserve what hasn’t come to them yet. And probably a lot of Texans should be p’o’d at First City Bank’s involvement in the swindle, and the casual arrogance of Cihak in using the bank as “his personal piggy-bank”, as the prosecutor put it. But it takes a special kind of perversion, to choose to simply disregard the torment inflicted by forcibly breaking a horse’s leg, in order to kill it, in order to collect the insurance money — I thankfully can’t even comprehend it. To think that Lundy is already out of jail is mind boggling. I am glad that you checked out this article. All people who love horse racing should be aware of what these crooks did. If you read A Wild Ride, I would like your opinion of it, knowing what you know now. Barbara, I cannot stand to read about what was done to Alydar. He was one of my loves and I always picked him against Affirmed. There is a special place in Hades for those people who betrayed him. Happiest of Birthdays to our Debbie G. Hope Leroy gets a treat too! Hugs. Sheena. This is not the UK racer, Hoof It. He’s still okay. Very sad news that this one with similar name is gone. I posted his info because of possible confusion with GB one. This Hoofit is from Down Under- NZ & AUS. Sheena. Glad to hear that Lady Cecil has good support. Training with Paul Nicholls and Callaghan will prepare him for this role. It’s bound to be tough for Jane Cecil to keep Warren Place going. Henry Cecil was brilliant and had incomparable experience, but even he went through bad patches and stayed the course. Good luck to her. I think that it’s great that she plans to keep with it. Sheena. Bravo to Laura for heading to see Steve. I have crossed the English Channel myself by water and it is always exciting as in scary. No wonder your island kingdom has not been successfully invaded since 1066. I am hoping that Steve does not have to stay in Europe too long to recover. He needs to be near his pal Kauto. Steve is a very handsome horse. He advertises himself on Twitter as “cheeky”. That characteristic seems to be rather prevalent among UK horses. They are also all talkers. Love talking horses with ipads. To our dear Debbie G.
To find the Thoroughbred grand. And made Debbie feel giddily silly. And in all the great filly had done. And that’s how Debbie G.
First learned of the great Z. Where Dawn had had such fun. So they paused to take stock. Oh my, just imagine their shock! If they a moment would bide. Searched for some way to reply. Of the man he now saw? That gave Seth Hancock quite a start! What had Jim been thinking! The Eclipse Horse of the Year. Debbie could hear her heart thud! Had they with those words their welcome outworn? And react with blazing scorn? For Horse of the Year! Scant praise for Z passed his lips. For 2010 Horse of the Year! That helped him to cope. But who now spoke his name? In the end hers is the victory. As all at last could tell. She very nearly took first! What did Debbie in the end do? When him you did see. Happy birthday and many, maany more, Debbie! Trina-I know how hard you work on these poems. Kudos on an epic about a special person. Aww, thank you Terry. You’re too sweet. I hope I get to meet you this year at the BC! High hoof, Trina! I just love this poem. High hoof to you both. Evidently many agreed that that day when our Zenny “lost”, she cemented her legacy in her greatest race ever. I wish she could have realized just how many hearts she won that day. Hugs to you, precious Z. Love you always! up my own negative thoughts towards him, but I was being unfair. After all he is a Claiborne horse and I have always respected them and the rich history they have. And I can never really dislike any horse because I love them so much. Yes, I can’t hold a grudge and would love to meet him. Never met a horse I can’t like. Hugs. I saw Blame last year at Claiborne. He is such a tiny guy, almost a cutting style Quarter horse looking guy. I couldn’t believe that he beat our Zenyatta! Amen, Barbara. As crazy as it may sound, I think Z’s fame and the affection everyone felt for her grew after her last race. Janet, I feel the same way. I tried to be mad at Blame, but I just couldn’t. I love horses too much to ever get mad at one. I may get upset with a trainer or jockey, but never a horse. I love Claiborne. I’ve been there 4 times and never get tired of it. Blame and War Front are my favorites there. Blame is a total sweetheart. I always take plenty of peppermints for him. Thanks for that poem, Trina. I also wasn’t fond of Blame, mostly for the reactions at the time from some of his connections and fans — those who just couldn’t see how great Zenyatta was. But whenever I think about her “loss” that day, I think how Zenny doesn’t care at all about that. Like I think John Shirreffs said at the time, “She probably thinks she won.” And she’s right. Congratulations to the Moss’s and John Shirreffs as Blingo won the Banker’s Stake at Belmont today. YAY! Congrats to our Mosses and John S. Well done! Here is Blingo’s race chart. The caller at Belmont is awesome in his summations! And here is the video of Blingo’s SUPER win. ENJOY! Congrats! Way to run, Blingo. It is beyond me how those Uk cheeky horses tpye on their ipads? Hope all have a nice day! AnnN C. Kauto is always smashing up his iPads. Moose said once that it is not easy to type with hooves. I think that Moose uses his phone. Hovis also has his own phone. Debbie, A very Happy Birthday. Sending a big hug!! Trina, another wonderful bio-poem. Well done! A chance to learn about Debbie & her family & her love of RA & Z. Not to mention she is a fellow Kentuckian. Wow. This could be a huge day for Mike Smith. I wouldn’t bet against him adding to his already record breaking win total at the BC. Terry, The Classic should be some race with Mike on GOD and Gary on sweet Muchie. Great story no matter who wins. Of course, you know where my money is going to be. Love me some Muchie. shirlee-How can one not root for MMM? Still going to be on pins and needles to see who gets her. It’s such a comfort to see that amended to racing or broodmare prospect. While I know she will likely be a terrific broodmare with fantastic genes, I’d love to see her race again. Thanks for sharing! I miss seeing our Red Prince! Please, can we get a video of him, please!!!! Yes, a new video or more pictures? Please? Just got a reply to question I asked on Stonestreet’s facebook page-Taco and Chili were on the last truck to Florida. There is a description of the trailer/truck etc. on Stonestreet.com News. I would post it here, but as y’all know, I am computer dumb. Promise I will learn how one of these days. I think this is the page you wanted. Thanks for sharing that news. Florida will never be the same. Taco and Chili are something else, along with The Coz! Wow, so much to comment on this morning! Trina, your poem takes my breath away. What a great talent! Happy birthday Debbie! Mosses, congratulations on Blingo’s win. He is new to me. What a handsome boy! Please God, we want the best for Eblouissante. Someone who will take good care of her and love her. She is so gorgeous. Thinking of Coz and Jess’s Dream in FL and Z13 growing up at Lane’s End. We look forward to any information we can get on them. Sheena. Like Laura said, let’s hope that there is an explanation. Horses trust their people to keep them safe from this kind of thing. Here is a nice photo of Steve before his accident. Get well Steve, and come home. Thinking of Coz today and hoping he is doing well. Would love to be there and see him. I am hoping for some pictures of our 13Z soon. Sending lots of virtual hugs and kisses to Zenyatta, 13 Z and Coz. Happy Birthday, Debby G.!!!!! Hope you had a special day. Trina’s poem for you was Tops. Ann-Glad to see you posting. In my mind Coz, Taco and Chili will always have a special connection. Hoping they all thrive. Wouldn’t it be grand to see the three of them on Kentucky Derby Day thundering toward the finish line. 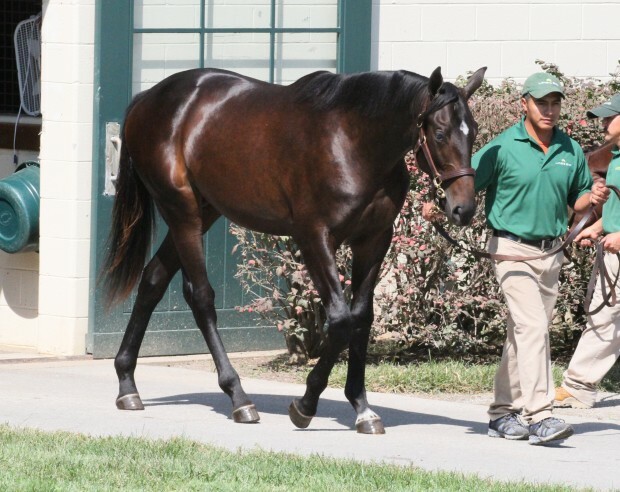 And don’t forget the Maggy Hawk filly, full sister to Afleet Alex. 2012 might go down as a banner year. Hopefully, we will be talking about the greatness and soundness of these 4 for many many years. For those who have been praying for little Capona, who could barely get up not long ago, look at this! One of the horses taken in with her has already been rehomed. Capona and her mom, Sweet Mary, are both doing so much better. Thanks, Barbara W., for this happy update! Capona is wonderful!!!! Dullahan is currently residing at Kenny Troutt’s WinStar Farm near Versailles, Ky., as Donegal explores options for his stud career. I hate to hear this, Sandy. I know how fond of him you are. I love him too. Maybe if they keep him at Winstar here in KY you can come down again and we can visit him. New Blog “Coz in Training” has been posted! 1st foal from Zen is Coz by Bernadini,right? 2nd is 13z, by Curlin,right? and now zen in foal with war front, right?